LONDON (AP) — Britain could consider a “Norway-plus” deal with the European Union if British Prime Minister Theresa May fails to win lawmakers’ approval next week for her unpopular Brexit deal, a senior minister said Saturday. Work and Pensions Secretary Amber Rudd was the first minister to publicly discuss a “Plan B” should May’s Brexit divorce deal with the EU be defeated in a parliamentary vote on Tuesday. Rudd, who backs May’s Brexit deal, said “anything could happen” — including a second referendum on whether Britain should leave the bloc. She warned of a chaotic period for the country if the government is defeated in Parliament on Brexit. She told the Times on Saturday that none of the possible alternatives is better than the current Brexit deal. But she acknowledged that if the deal doesn’t pass, she would prefer a model similar to that of Norway, which is not an EU member but is part of the European Economic Area. That would mean Britain stays part of the EU’s vast single market, with goods, services and people continuing to move within the bloc in the same way as before, limiting potential disruptions to the British economy. 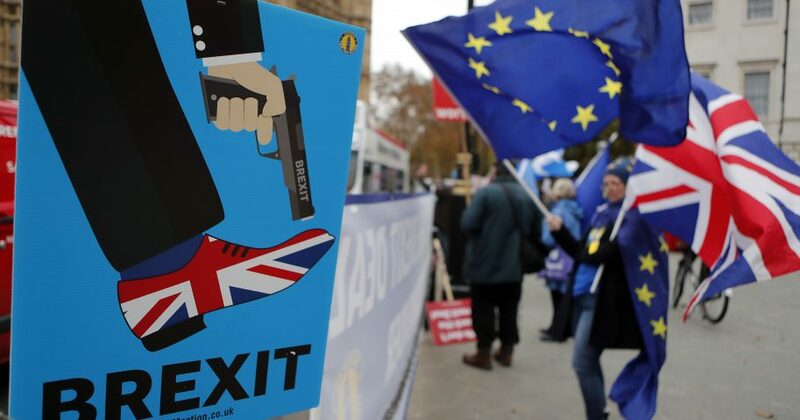 The divorce agreement that May struck with the EU is widely opposed by British lawmakers across the political spectrum, and her Conservative government must convince skeptical lawmakers the deal is a good one ahead of Tuesday’s vote. A heavy defeat would sink the agreement, leaving the U.K. facing a messy “no-deal” Brexit when it leaves the bloc on March 29, and could topple May and her government. Pro-Brexit lawmakers say May’s deal keeps Britain bound too closely to the EU, while pro-EU politicians say it erects barriers between the U.K. and its biggest trading partner and leaves many details of the future relationship undecided. Both sides also strongly object to a “backstop” provision in the Brexit agreement that would keep Britain in a customs union with the EU in order to guarantee an open border between EU member Ireland and the U.K.’s Northern Ireland. Northern Ireland’s Democratic Unionist Party, which props up May’s minority government, rejects the measure because it would treat Northern Ireland differently from the rest of the U.K.
An analysis by Britain’s Press Association showed that just 27 of the 163 British lawmakers who have spoken out indicated they would back May’s deal, compared with 122 — including 29 from May’s own Conservative Party — who say they will vote against it. EU officials, however, have insisted that May’s Brexit deal is the best and only one on offer and said they will not renegotiate.